Kurt Shipley from Oklahoma spent all week on the 88 spot for a shot at one of the big tuna and on his last day got his wish! This fish could only be estimated at about 175 pounds and took two hours. The fishing on the 88 spot near Cerralvo was sporadic to spectacular all week. Some days there were no fish. Other days there were only "smaller" 40 pounders. The next day the fish were all beasts over 100 pounds! Some days there were very few boats and other days, it was a freeway! It has been a long time since we've seen this kind of quality. She refused any assistance and put this 110-pound monster in the boat all by herself! 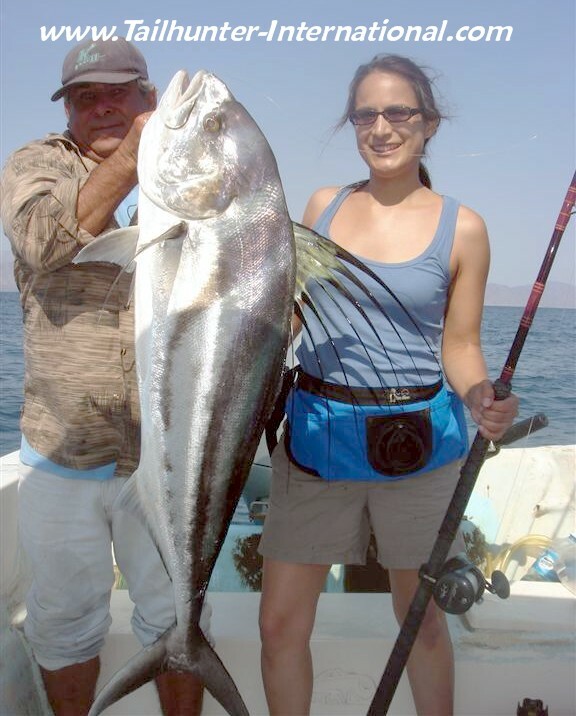 Mary Wehner poses with Captain Pancho and her big fish that she took on a mini-3-foot Whopper Stopper rod on the 88 spot. Mary is always doing stuff like that every time she visits. Last year, it was a big blue marlin! Norm Whittlesey is tough-as-nails. He grew up on a dairy farm. Worked in a coal mine and was part of the 101'st Airborne Divison then went back to school to become a college professor! He still has time to tend 60 acres in Washington and after every day of fishing, he would actually go work out for an hour at the hotel gym! 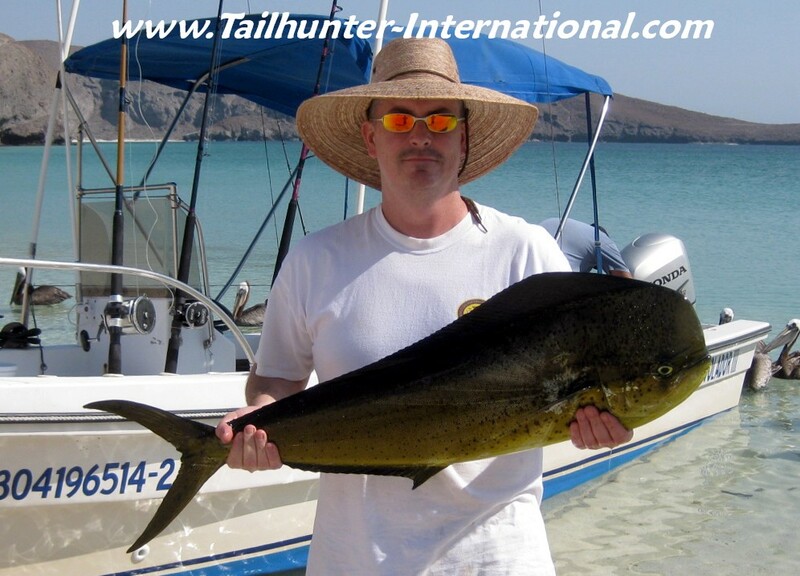 He rocks and had a fantastic week of fishing including some of the largest dorado of the week fishing with our Tailhunter La Paz fleet then some of the huge tuna with our Tailhunter Las Arenas fleet. Another massive beast on the beach. Scott Burmeister from New Mexico isn't sure he wanted to do anymore tuna fishing after this fish estimated at over 150 pounds tore into his rig off Cerralvo Island. Anglers were battling these fish from 1-4 hours with the fish winning more often than not. Some days, the fish would only eat light line so anglers were already at a disadvantage! Like I said...a week of great (and often funny!) 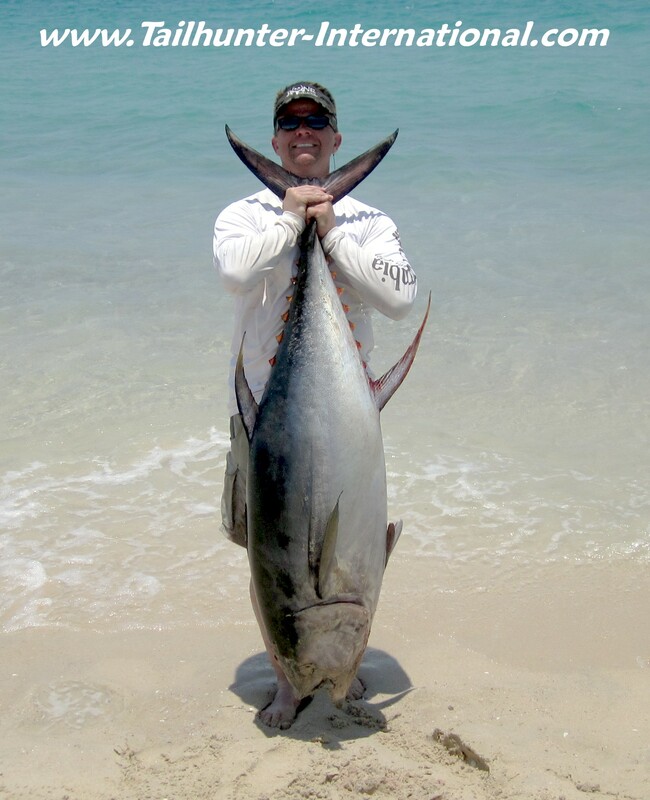 stories....If you're been following the reports all week, the big tuna went "on the chew" off Cerralvo Island this week with fish up to 200 pounds tearing up anglers and lots of gear. The problem is that some of these big fish would ONLY eat 40 pound test! Some of the battles lasted 1, 2, 3 or more hours with the fish usually winning over the exhausted anglers. So...take a look at this picture of our good buddies Darrell George (holding the rod) and Bo Herrera (trying to hang onto an exhausted Darrell). These guys took alot of flack for this photo they were showing around the restaurant last night and was snapped by a laughing Captain Victor! I guess you could write your own funny caption! However, the truth is that they had a fish of about 100 pounds on the line and only 40 pound test. It was whupping them when the force of the fish broke the handle off the reel! Bo stepped right up (what are buddies for?) to help hold onto Darrell and they tag-teamed to hand-line in the big fish! (The guys are great sports about the funny picture not realizing that Captain Victor was taking photos with THEIR camera!). They just went back to New Mexico today with over 250 pounds of dorado, snapper and tuna fillets after a great week! Steve's got a nice pargo liso! Many anglers aren't out here looking for pargo this time of year as they're interested in the pelagic species like tuna, dorado, wahoo and billfish. But that makes this an ideal time to chase pargo since there's not much pressure on the fish! It doesn't make them any easier to catch. They'll bite, but then they go quickly back to the rocks and cut you off! 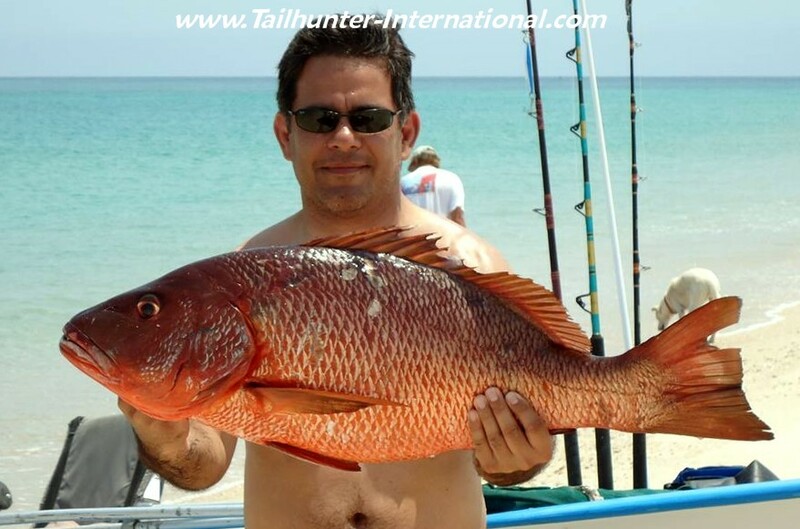 Check out this nice pargo liso (mullet snapper). I almost forgot...we got at least one or two marlin or sailfish biters every day this week. Most of the fish were released. This is Dan Bernardo's first marlin and they were unable to release it after it swallowed the hook. 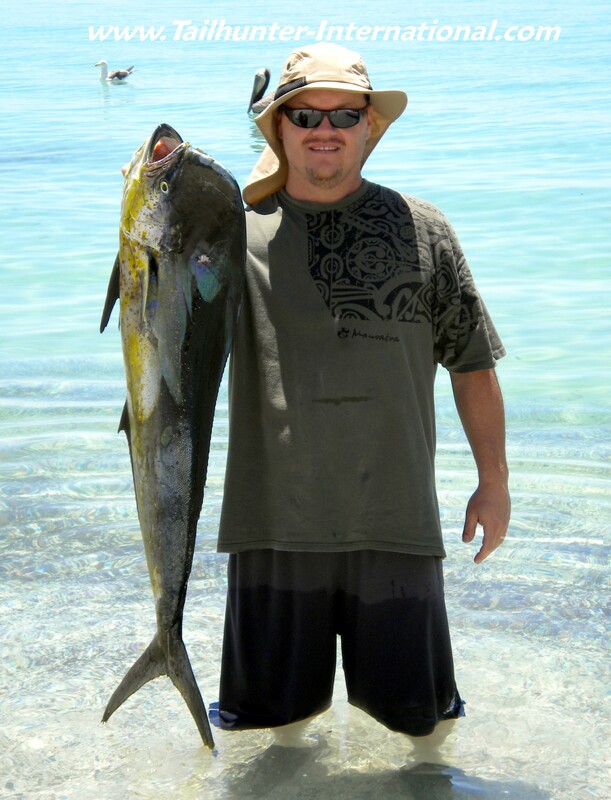 Dan is from Washington State and had a banner week with tuna, dorado and his first marlin. Most of the billfish were found in the channel between Cerralvo and Espirito Santo Islands. 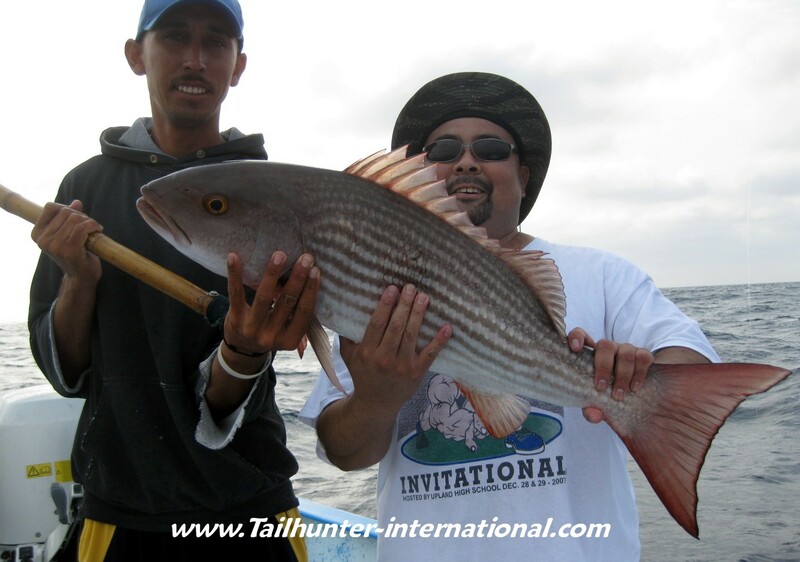 Phil Okamoto from Los Angeles gets and assist from Captain Pancho on his first pargo. 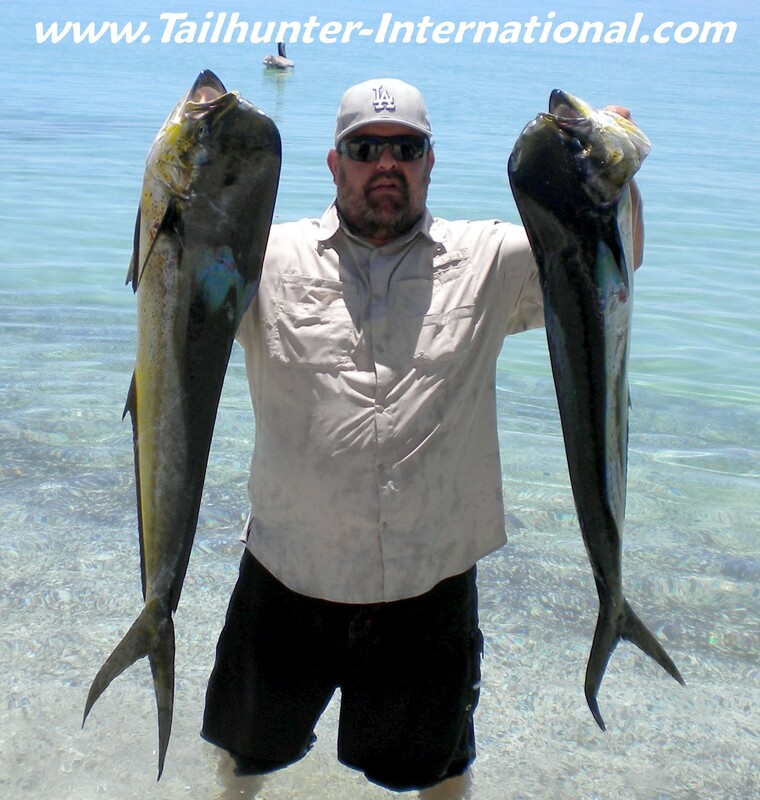 Phil also got his first marlin and some big dorado this week. High school football coach Randy Strange got a mess of dorado after a good week of dorado fishing with out Tailhunter La Paz fleet including this decent-sized bull. Randy is from the Ventura CA area. Troy Coffey keeps coming down to fish and NEVER got in the fish report! Well, this time YOU MADE IT TROY! Good job! Troy got into that dorado bite we've had out've La Paz. He had a few rough days, but finally got into the bite. The fish are scattered but if you find the spot, it can be rodeo on you. Like I said...lots of funny stories this week. Coach Don Rea from Ventura is the BRAVEST MAN I KNOW! He has been coming to see us for years...several times a year. He is a huge fan of catching dorado and racing so he spent the week chasing mahi mahi and taking a day to watch the popular Coyote 300 off -road race here in La Paz. This man is fearless. In order to be here, he skipped his 43rd wedding anniversary; 2 birthdays; 1 graduation and Father's Day! His photos has been in our fishing report so often I thought he's enjoy seeing his photo at the race instead! Note the carefully placed "hover hands!" 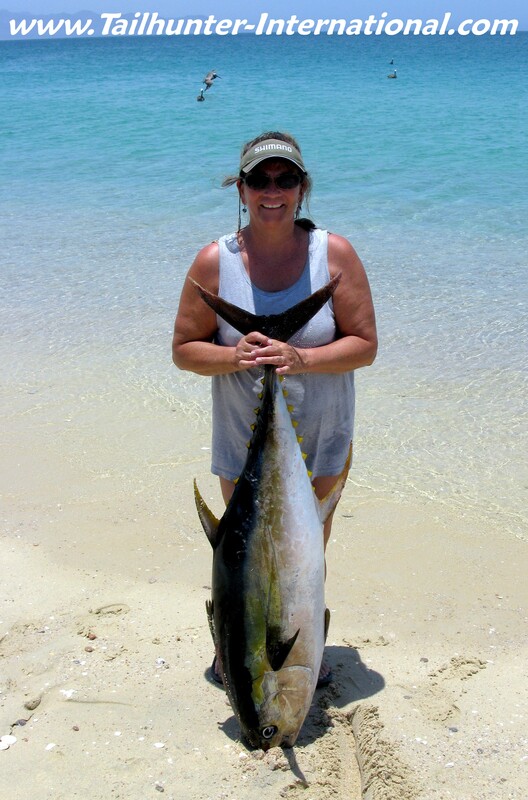 In all honesty, Don's wife, Cathie is a great sport and avid fishermen herself and let him come down with his buddy. But he is bringing Cathie to La Paz next month. Got some great stuff this week. Check it out. Click the link! 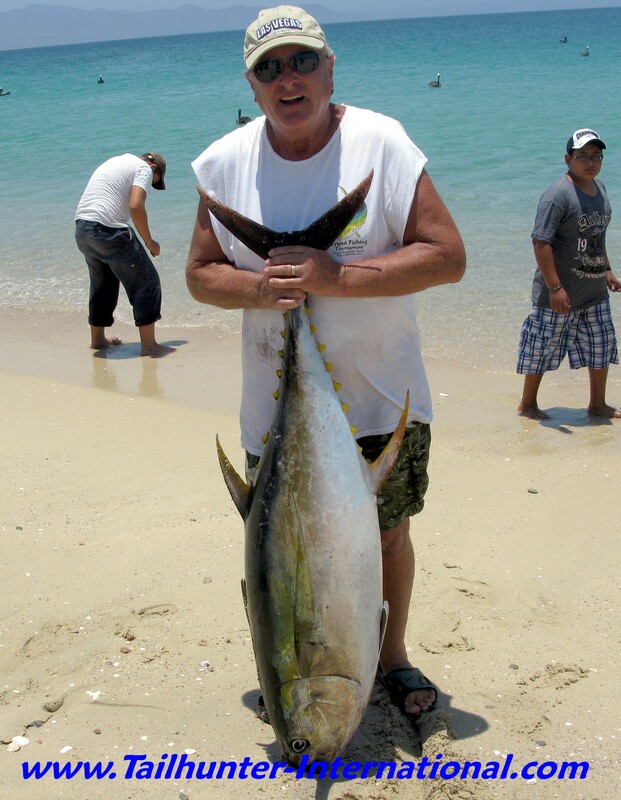 BIG TUNA STORM BACK DORADO STEADY BUT NOT ALL DAYS GOOD IN ALL PLACES! 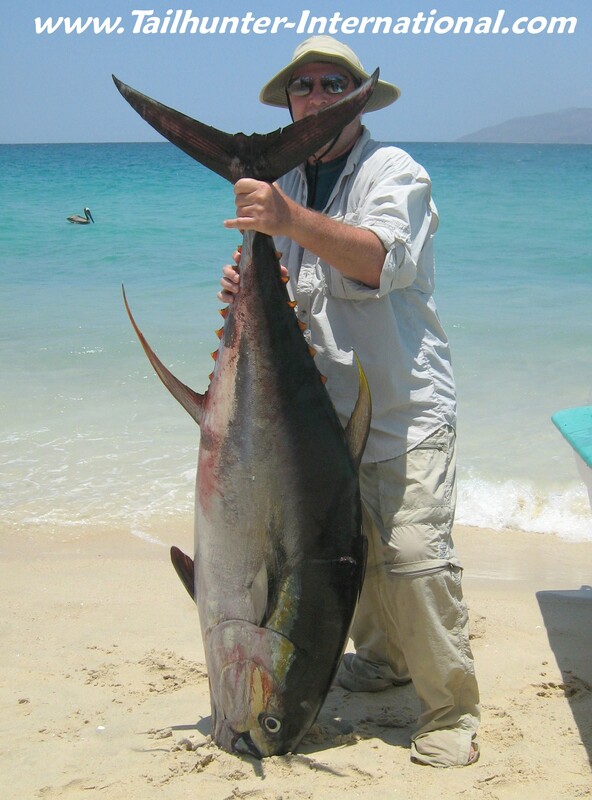 big tuna or a big dorado or marlin! were using 30 and 40 pound test to get bit! zone” very quiet. Exhausted. Shuffling their feet. Unable to lift their arms. Coated in salt, sweat and fish scum. Glassy-eyed and de-hydrated! Be careful what you ask for! didn’t think they swam fast enough to catch a trolled Rapala! beaches and larger dorado models if you go hopping around the buoys outside. mackerel or pilot fish that make great bigger live baits! and rough. Others go completely flat. Yes, there are still some big tuna out at the 88 bank east of Cerralvo Island. Not alot. Not often but you might just be one of the hot boats that particular day! Steve McGavern calls San Diego and Loreto "home" but ran down to us for a quick shot at the tuna and got two nice fat chunks! Dad Mike Akiyoshi brought sons Trevor (left) and Kevin (right) down for a few days fishing and got a mess of dorado the first day then put in some serious rail time two days at the 88 getting some 45 pound class yellowfin that ended up back at our Tailhunter Restaurant as sashime, Hawaiian poke and barbecued collars and bellies with garlic! Drove us all crazy with how good it tasted! 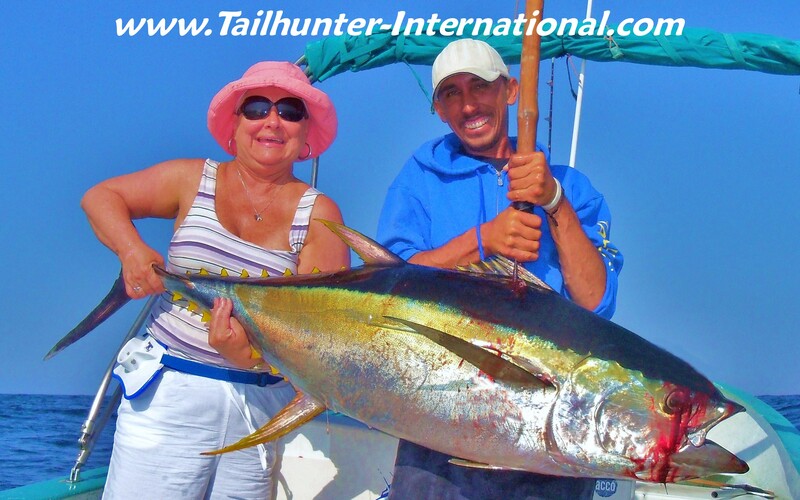 With all the tuna pictures this week, one would be inclined to think we had a great tuna bite going on, when in fact it was the dorado that really did the best although it wasn't until later in the week when we got into the groove. Early in the week the bite was stingy at best with fish all around, but not willing to chew. As we passed the full moon, the fish came to party. 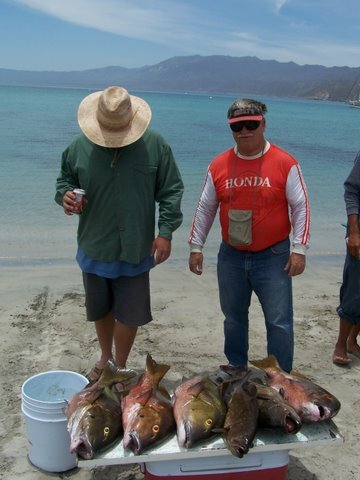 Mark Gillespie from Huntington Beach CA was on his first trip to La Paz with his buddy "El Al" Schneider and shows off some of their catch. Putting the "wood" to his first big tuna of the day, Trevor Akiyoshi from Upland CA is rewarded with the nice tuna in the inset photo. When someone is on a big fish, there's not much the captain can do except look on like Captain Jorge with his hands on his hip! Smile Trev! Not every fish can be a giant, but a first-time fish on a flyrod is what Chrs Daniels from Sacramento wanted. And a smile is a smile! She's holding a nice little dog-tooth snapper. 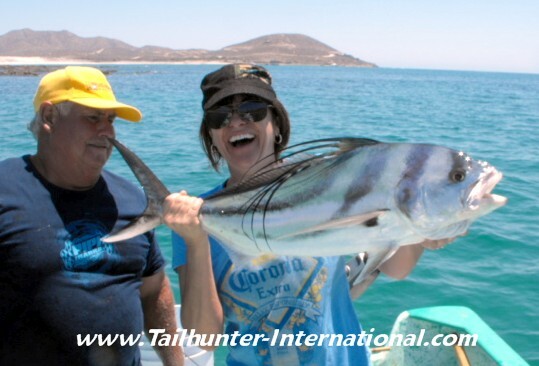 Rhonda McGavern from San Diego was another fortunate angler who got into the larger tuna this past week at the 88 spot east of Cerralvo Island. breaking but they just didn’t want to eat. We’d toss baits at them. The good dorado bite out’ve La Paz got back on track. until you get the 2nd hookup. happens to be one of the days that the fish come to the party! roosters have been a fun fall-back species if nothing else is going on. for the ones getting brought in, their bellies are full of little dorado! feathers would certainly be in my trolling pattern! That’s our story! God bless all you dads and Happy Fathers’ Day everyone! Look carefully at the size of these bulls! 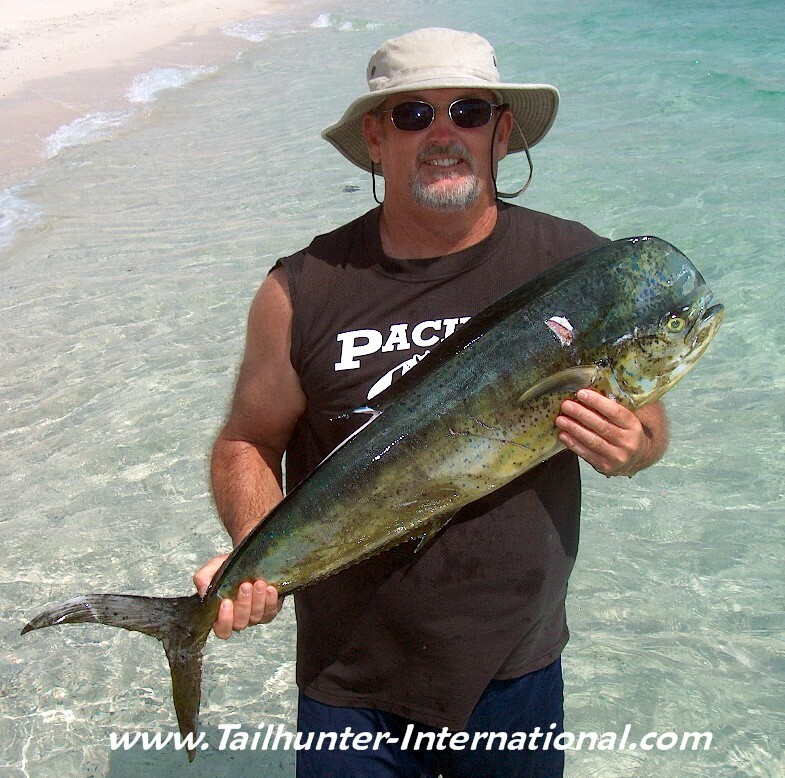 The larger dorado are estimated to be in the 50-pound class! We're seeing some incredibly big dorado early this season certainly a bit too big to lift up for the camera for Dwight Jaeger from Arizon and his 10-year-old grandson, Garrett Santana, from Simi Valley CA. 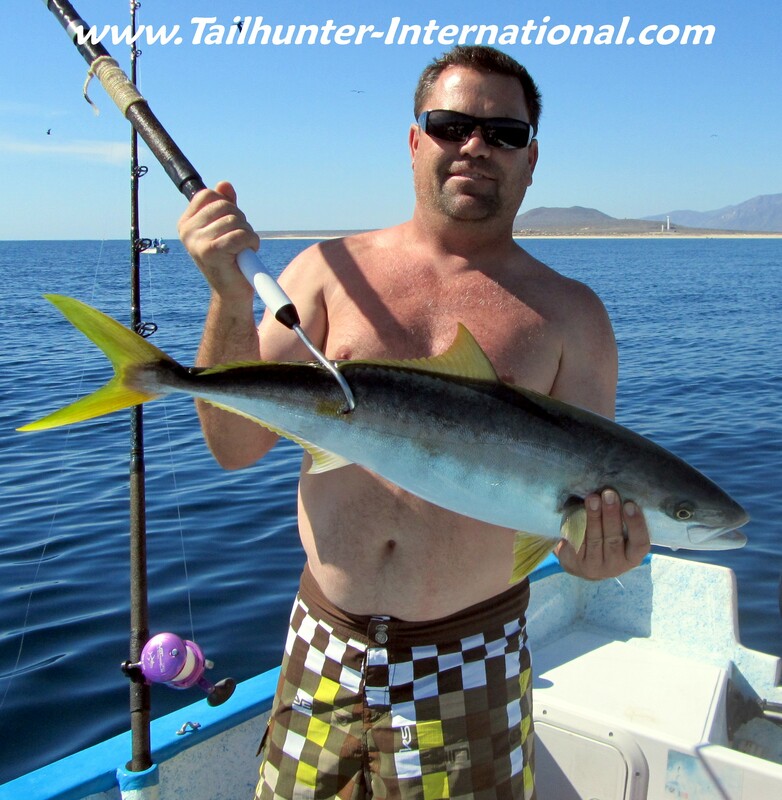 The dorado bite all week for our Tailhunter La Paz fleet has been very very good! 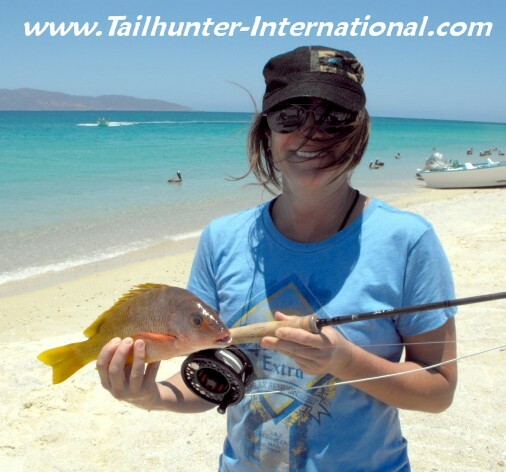 Los Angeles angler, Jodi Marston always seems to do well when she visits and she got into a great day of dorado fishing with her husband, Jeff working that red hot dorado area north of La Paz. 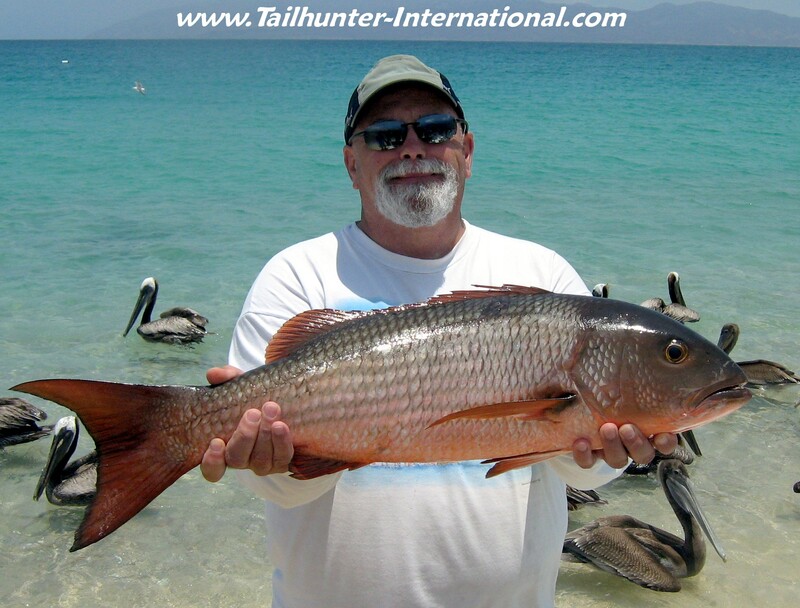 We're having a stellar year on the roosters, especially around Las Arenas with more big fish still getting caught. 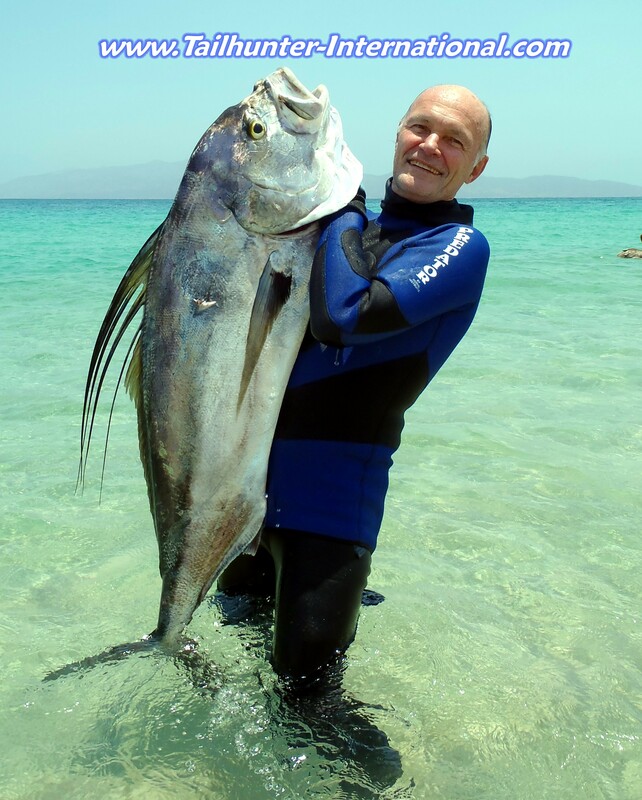 Marty Davis gets a hand from Captain Raymundo before releasing this big guy. Rich Santana from Simi Valley CA had a pretty good few days for his first time to La Paz with lots of big dorado like these fishing with our Tailhunter La Paz fleet. 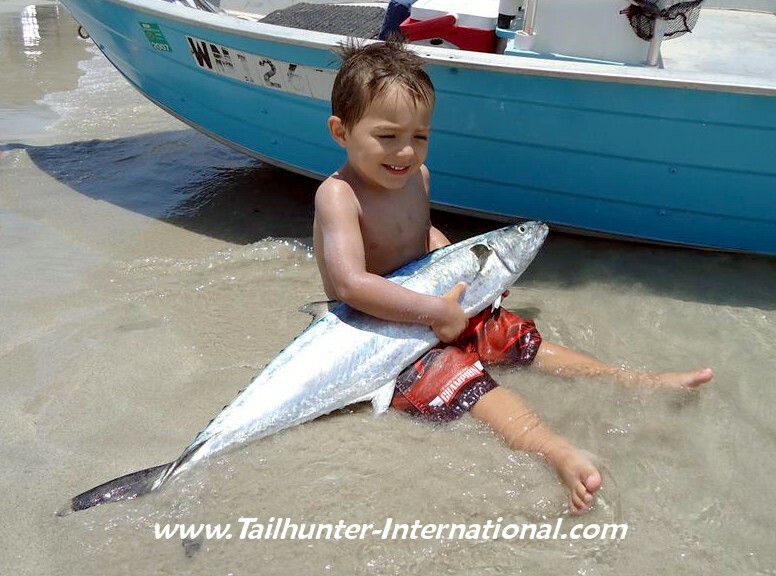 When you catch a big fish, it's gonna be a great show-and-tell when you get home! Little Caleb Davis doesn't want to let go of his big sierra! Not only is this a big sierra but highly unusual to be catching sierra this late in the season. Sierra are normally cooler water fish. 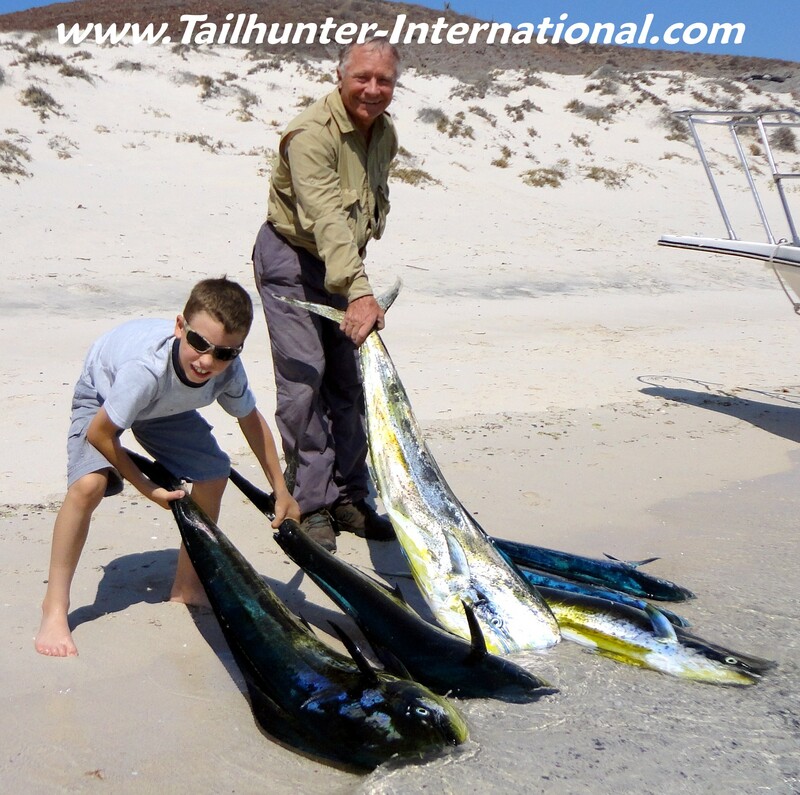 It's always great to be a part of the action when a youngster gets their first fish and the youngsters had a great week, especially on dorado. Ten-year-old Garrett Santana holds his first dorado but later got into alot more including a 45-pound class bruiser bull he handled all by himself (see the video below). They definitely don't have dog-tooth-snapper in Oklahoma, but that's where Mike Ballesteros is from and he took this great eating doggie fishing out've Las Arenas. Oh, the joy! Chris Daniels from the Sacramento CA area wanted just one day to try fishing with the flyrod and she succeeded in getting a nice-sized rooster to the boat catch-and-release! It's been another great week for the roosterfish! It beats working! Jeff Marston made a quick run down from L.A. for a fast get-away but it was enough to fill an ice chest full of dorado fillets like these he got outside of La Paz Bay after a day of fishing. DORADO BITE TAKES CENTER STAGE ! BIG TUNA OFF and ON (again) ! that had alot to do with the good bite! a no-brainer. There’s lines of sargasso weeds out in the channel. of fishing, we’ve already caught more BIG dorado than all of last year. 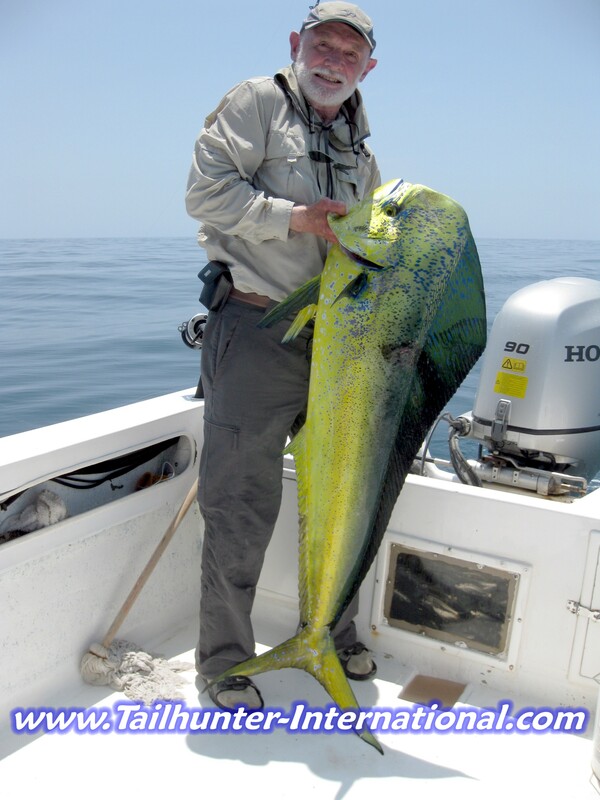 Last year, a “BIG” dorado was 20-25 pounds. Very unusual for our area. 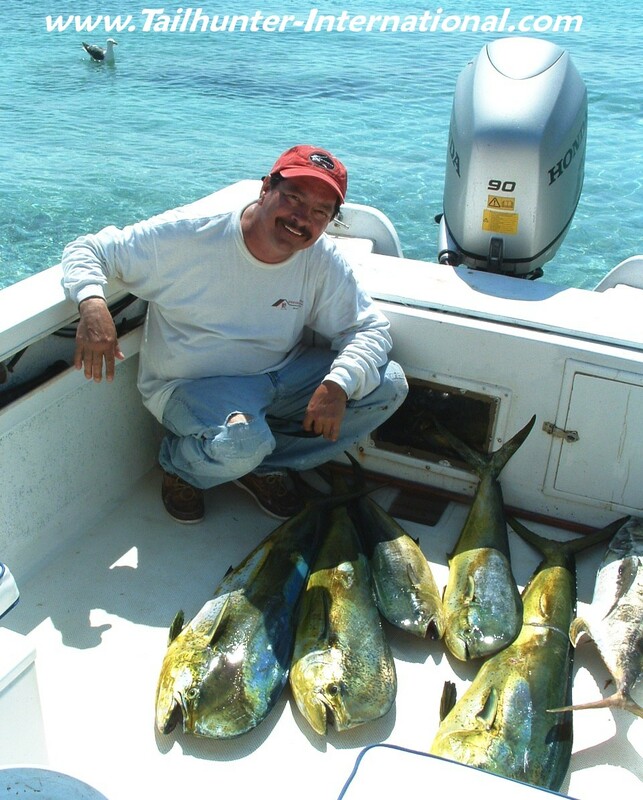 We had alot of dorado, but just not many big ones. bonito and skipjack also feeding on all the bait. certainly not bad at all! Island. The thing about that is it’s a long run in the pangas. were down. Only a few or no hookups. One of our guys said there’s 20-60 boats out there and it’s guerilla fishing with everyone chasing boiling fish or the porpoise schools crisscrossing each other in races to the fish or running over each other’s lines and chum lines. However FLASH…just as I’m putting up this report the BIG TUNA CAME CRASHING AGAIN AT THE 88 SPOT! Lots of big fish. Maybe by the time you are reading this the fish are going full turbo or…got lockjaw again. However, the reports coming in at this very moment as I am typing this are tuna in the 50-150 pound class! Pictures as soon as I get them! given how warm the waters are. 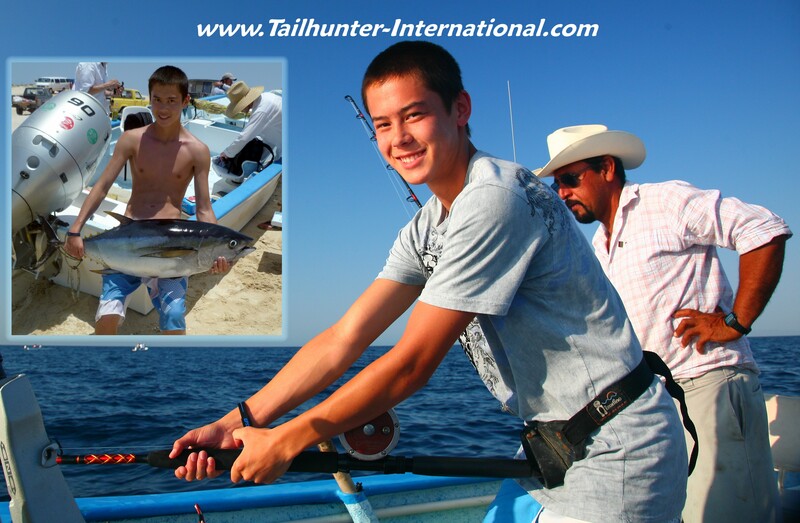 I only had a few seconds to work with this week, but watch young Garrett and his big dorado. Take a look at the leaps. It’s short, but you get the idea! Enjoy! FLASH UPDATE - We got a few flurries of big tuna being lost, but finally, the fish came up and bit big time late...all out at the 88 spot. Big fish in the 80-200 pound class like this estimated 150 pounder that Roger Thompson got. 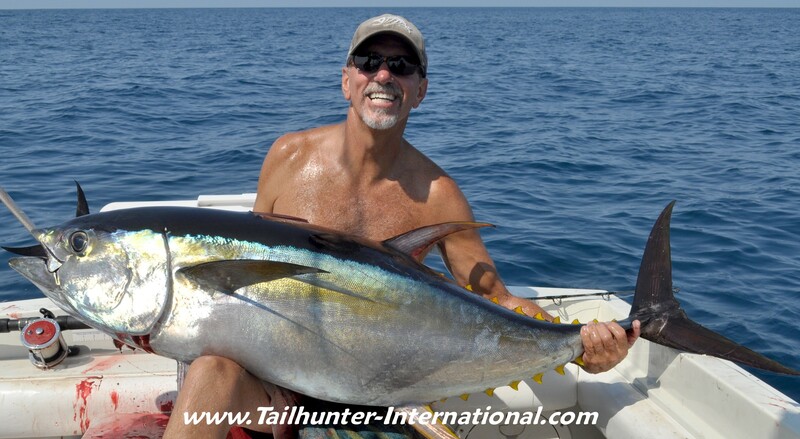 We had two clients bust off on fish and another that lost a rod and reel (Penn International) that went overboard when he got tired and changed hands right when the fish surged during a 2-hour battle. No telling how long the fish will stay, but some big boys on the growl! Will keep you posted! It's really hard to pose correctly for a good photo when a big fresh ticked-off bull dorado comes aboard on the gaff and is whacking you in the gut, crotch and kneecaps, but this big bull by Jon Luker of Arroyo Grande shows off one of the big dorado we got this week with dorado action heating up just-in-time for the summer bite with some 20-40 pound fish already in the mix! 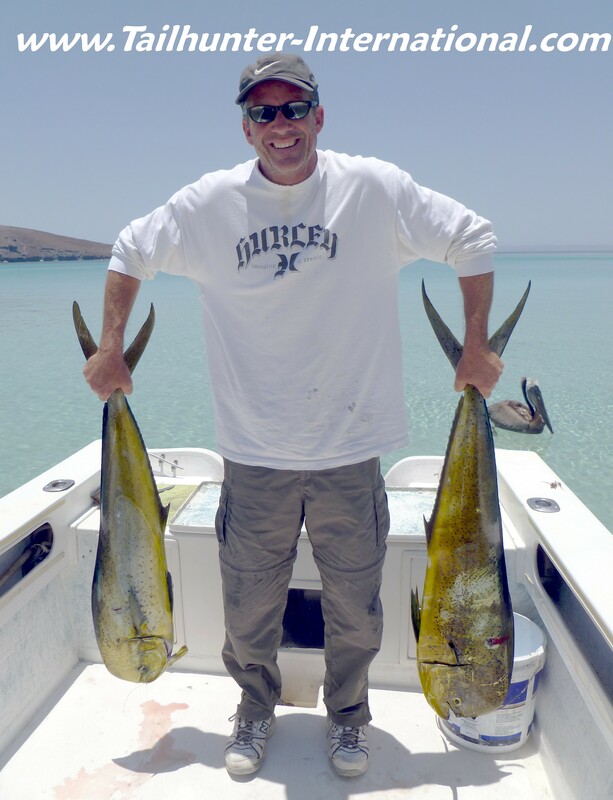 Jon is one of our best long-time amigos and he got this fish just north of La Paz where sargasso weeds and schools of mahi are starting to build up! Sometimes they even let my rusty Baja bones in the pangas! It was another great week of roosterfishing! 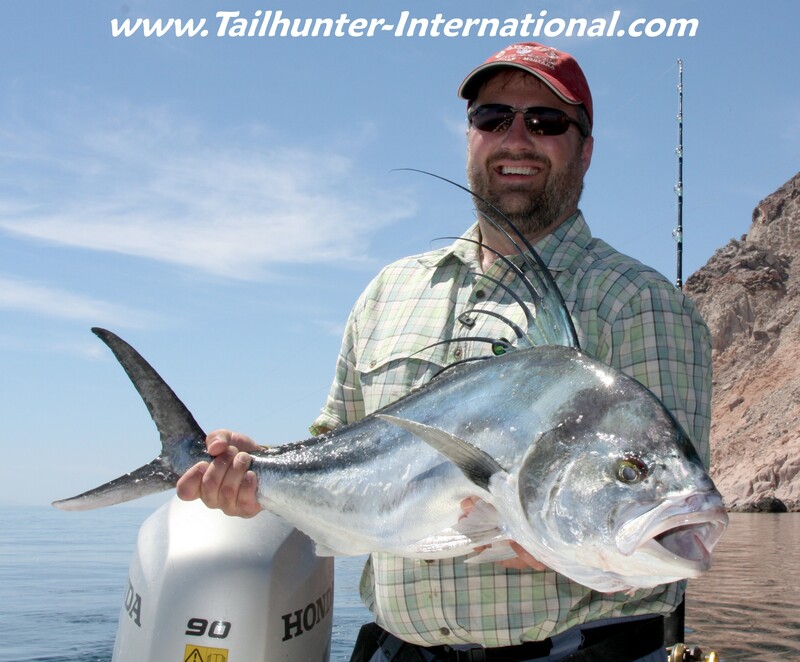 Check out this nice pez gallo that Walker Schearer nailed on light tackle just off the little cliffs outside of Bahia de Los Muertos. 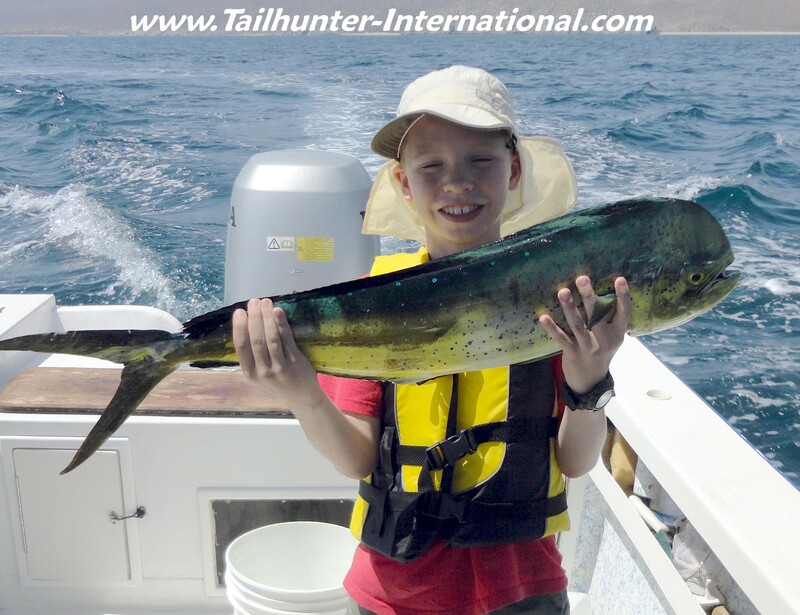 The 10-year-old caught many of his first and largest fish over the week including dorado, roosters, jacks and many others! Pretty good for a Montana kid on his first trip to Mexico! 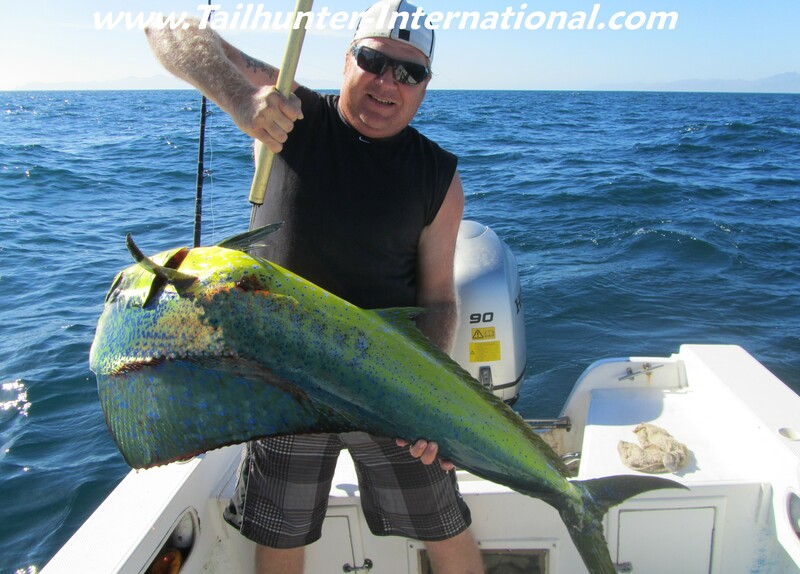 Vince Acosta got his "personal best" largest dorado ever fishing with us and our Tailhunter La Paz fleet. 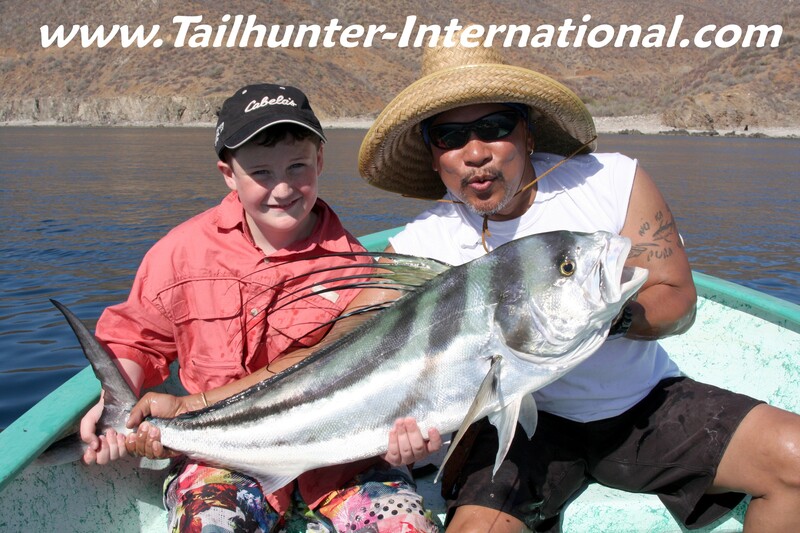 The Pacific Beach angler was fishing near Espiritu Santo Island north of La Paz with his buddy, Jude Martinez (see photo below) when they ran into the big schools. When you use a PINK reel and wear wild checkered shorts like Mike Davis, how can I not post your photo in the weekly report? 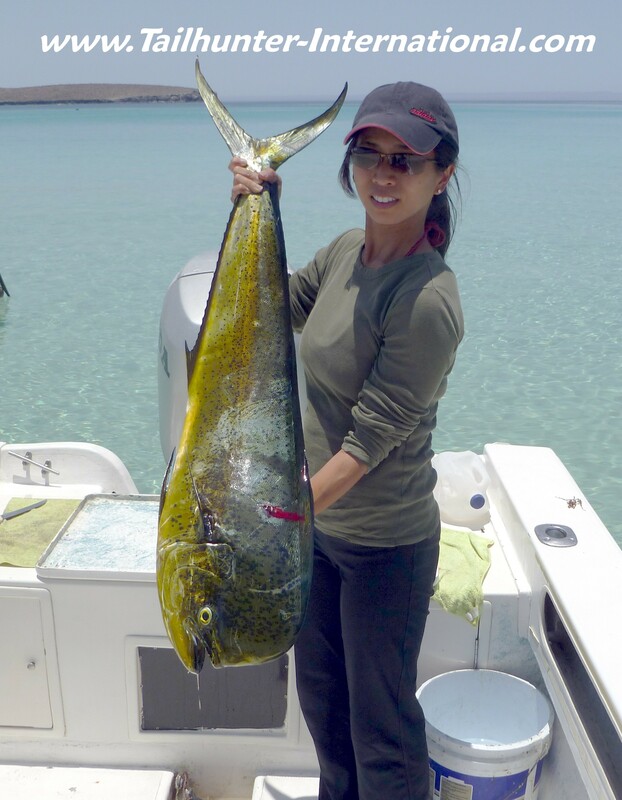 LOL...Despite warming waters and air temps, we're still getting some yellowtail here and there. 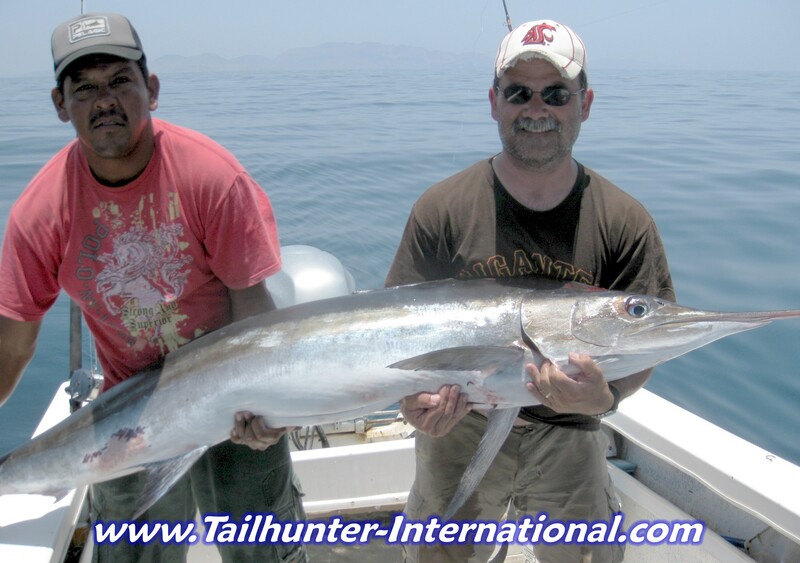 Mike got this one fishing with our Tailhunter Las Arenas fleet just out of Bahia de Los Muertos! 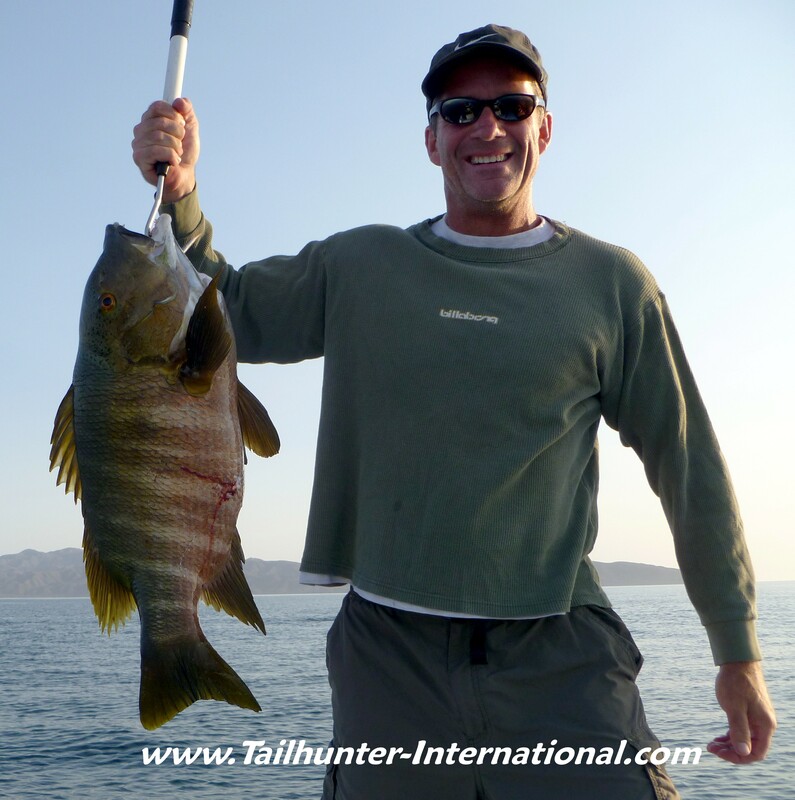 Nice way to start the morning with barred pargo in the boat for Jeff Marston caught out of Muertos Bay fishing with our Tailhunter Las Arenas fleet. Barred pargo have been a nice bottom species for us the last few weeks. A mess 'o' pargo and cabrilla (seabass) meat is what Mike O'Neil and Joe Jacobs got going for them with this nice catch of barred pargo they nailed fishing with our Tailhunter Las Arenas Fleet. Wish Mike had looked up! Both are from the San Diego area. There was a rumor that they had to wake Jude Martinez up when this big dorado bit as he was snoozing! But he did get it to the boat and that's what counted. 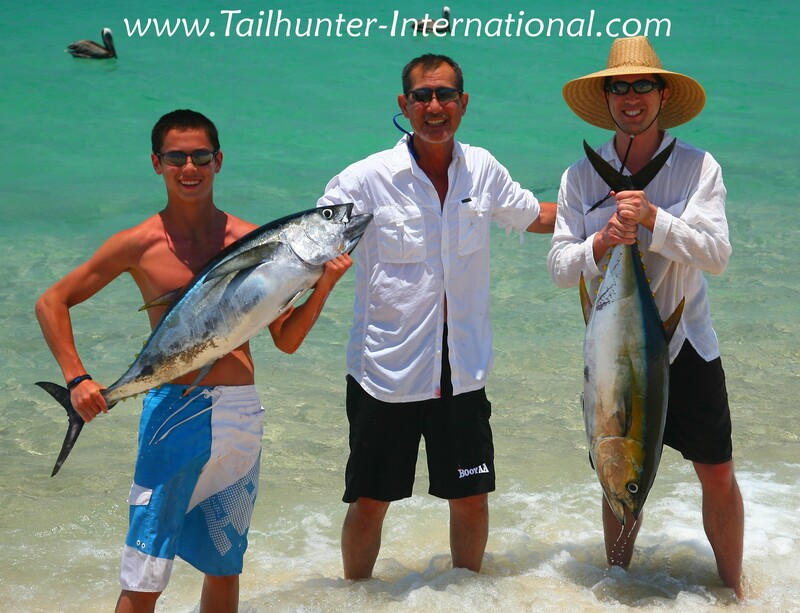 It was a pretty solid week of dorado fishing especially for our Tailhunter La Paz fleet. We were all this age! When you are 8-years-old every fish is worthy of a big smile and "show-and-tell." Wyatt Schearer came to visit us from Montana where he actually has a trout pond on the family property and knows how to fish, but couldn't be prouder of this nice yellowtail he got in Pilots Cove! He pulled on it like a veteran! 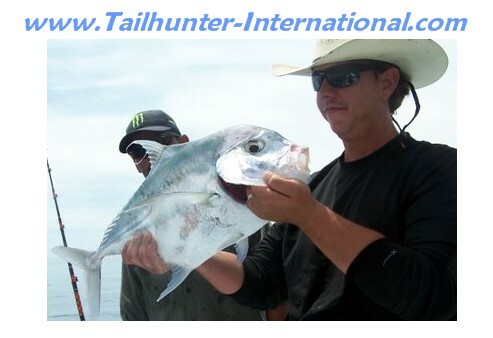 One nice surprise the last week or two has been the appearance of pompano...members of the jack family related to roosterfish, jack, crevalle, yellowtail and amberjack...these great eating fish are fun to catch and we've been finding them on the dropoffs next to sandy areas of the beach or rocks. Chip Chandler of San Diego holds up one he got out of Las Arenas. This past week or so, many clients have been catching either personal best "largest" fish or personal best "first time ever" fish. Chad Shearer, the popular host of the outdoor show "Shoot Straight" http://www.shootstraightTV.com put down his rifles and bow to come visit us getting 19 different species in 3 days fishing many on the flyrod and light tackle including this rooster which was revived and released. 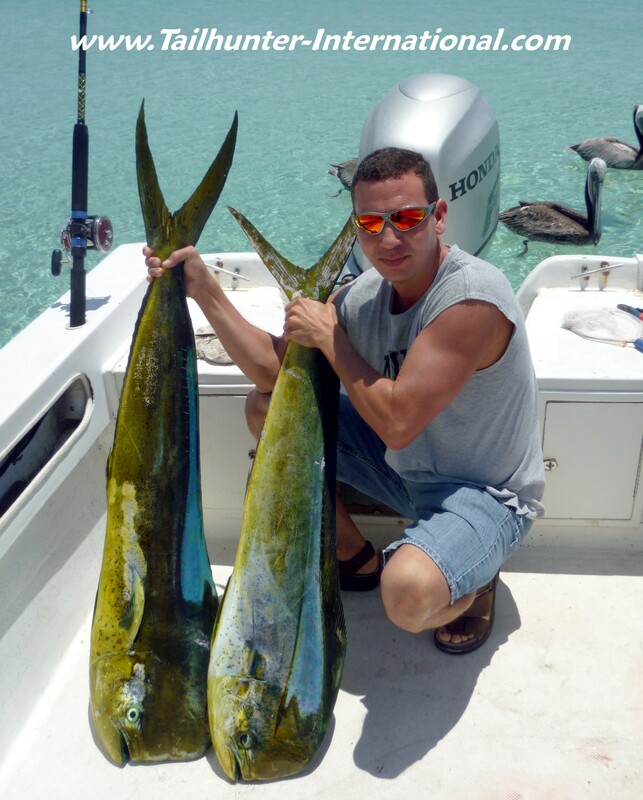 DORADO AND ROOSTERFISH COME ON STRONG TO START SUMMER BITE! After I had posted up the fishing report we got all kinds of late reportr that I couldn’t get in on time. The big boy tuna finally came up on us out at the 88 spot outside of Cerralvo Island. These are BIG fish up to 200 pounds and several guys had long battles only to lose fish . Others broke rods and reels. Others just quit realizing they were overmatched. Some of these fish are being fought for 1-3 hours! We’ll keep you posted! Exciting stuff and never sure how long this will last! 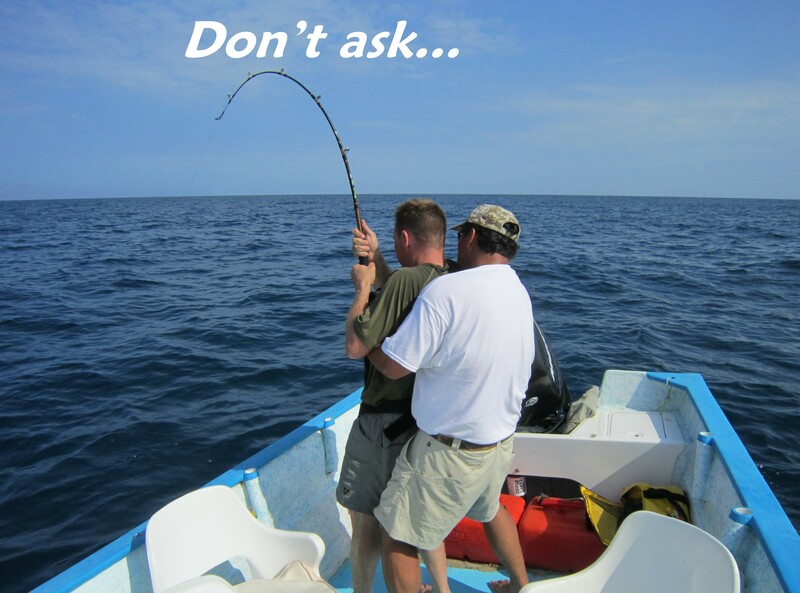 And now back to your regular fishing programing…read on!!!! Although the bite hasn’t been wide-open, it can be! fish mixed in as well! Paz. But, our Las Arenas boats are getting dorado too. Actually, quite a mix of fish. hookups on big cabrilla , pargo, roosterfish, marlin and sails. occasional tuna and roosterfish and wahoo. 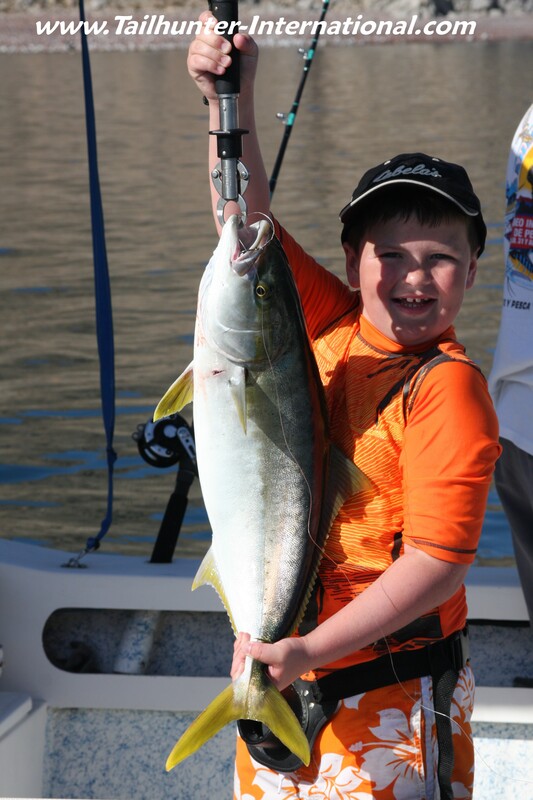 Oh…and we’re still getting a few stray yellowtail too! It’s actually a mixture of the last week-and-a-half, but hope you enjoy it. I’m working with some new cameras and editing program so bear with me and we’ll work out the bugs. Still…I think it’s not bad for a first effort with the new gear! Got some nice footage for you to check out including some underwater shots too! Just click the link!